Zack, pictured left, with his younger brother Toby. Ian Hughes doesn’t mince words. Ian, is the father of nine-year-old Zachary and has been very pleased with how his son was able to use Chemo Duck to communicate during his nearly four years of cancer treatment while a patient at Birmingham Children’s Hospital in England, UK. In December 2007, Zack was diagnosed with ALL. 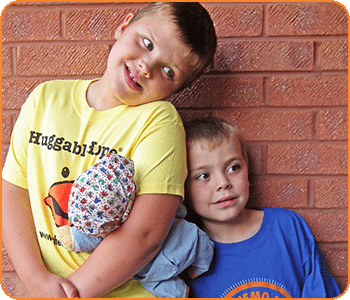 Soon after he received Chemo Duck, which the Hughes family carried with them to all of Zack’s clinic and hospital stays, which he simply called ‘Duck’. Chemo Duck comes outfitted with either a central line or a port-a-catheter, depending on the cancer diagnosis and treatment required. The Hughes’ decided to add a few other elements to Zack’s duck in an effort to provide their son with an even more realistic picture. In the UK, the central line catheters are called wigglies. Zack’s grandmother made him a wiggly bag to hold the lines safely when not in use. Duck also received his own wiggly bag. When Zack required a naso-gastric tube (ng), Duck got one too. Duck became a mirror image, so to speak of Zack, which was essential as the Hughes’ discovered that their son was dealing with more than a cancer diagnosis. Within months they found that he had Klinefelter Syndrome, a set of symptoms resulting from additional X genetic material in males, which is characterized by signs developmental delays, speech and language deficits, and learning disabilities. An autism diagnosis followed one year later. Designed as a therapeutic tool to assist parents and medical personnel better prepare children for chemotherapy, Zack’s duck had a few unexpected advantages, said Hughes. “Because of the Klinefelter’s, he has very little expressive language and cannot tell us that he is pain for instance,” explained Ian. “He couldn’t explain things or even talk. So we found that Duck was a good thing because it helped him with his frustrations and anger. We saw him either imitate what the doctors were going to do or if he was angry, he would take it out on Duck. Now in remission, Zack’s last chemo was in 2011, Duck watches over him from a shelf in his room.